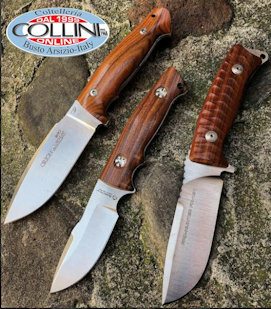 Cold Steel, one of the leading knife brands in the world, has found that one of their most popular products is the SRK, an acronym for Survival Rescue Knife. This knife became part of the standard equipment of the Navy Seals during the BUD / S training course (Basic Underwater Demolition / Seal). Despite having a very clean and simple design, its quality and durability have made it a great survival and utility knife. The weight, the perfect dimensions and, consequently, its manageability, are characteristics that have led to its popularity over the years, to the point of updating its production. The SRK was initially made of carbon V steel with epoxy coating whilst, in the current version, the knife is made of Japanese AUS-8A steel with Teflon coating (more resistant than the previous one). Some argue that this steel gives an inferior performance compared to that used in the previous model, but we must consider that all steels are inevitably a compromise in at least one aspect of their performance. For an effective survival knife I believe that the AUS-8A steel can actually provide a reasonable balance between durability, corrosion resistance and cutting edge retention. The SRK's full tang blade is 15.5 cm in length and has a pleasant curvature of the cutting edge, which ends with a very effective and resistant clip-point. A swage on the blade has been quite abruptly tapered so as to optimise the performance of penetration without, however, compromising tip resistance. Both the blade and Teflon coating are of excellent quality, and the last one has a very attractive black colour. The blade thickness of 5 mm is remarkable in proportion to its length; this thickness gives sufficient weight and strength for heavy work, while the SRK’s overall length is small enough to make it effective for utility work as well. The knife, as always when we talk about Cold Steel products, comes with an impeccable sharpness. After completing cutting tests on various materials (from cardboard, leather, mooring ropes, car safety belts, up to wood), it was easy to restore the edge with a sharpening stone. It needed just a few steps to get a more than satisfactory result, which is essential for a tactical/survival knife. The handle is made of Kraton with the typical Cold Steel's product texture, designed to ensure a solid and comfortable grip, even in adverse conditions (for example the use during a rainy day or, more simply, with sweaty hands). The handle does not have a very pronounced guard which probably, for larger hands, may appear be quite small, resulting in the feeling of not being able to operate the knife with the required safety. This problem can be overcome, in part, by applying the lanyard to the knife, thanks to the presence at the end of the handle of the appropriate hole. One of the criticisms made to some kind of Kraton ™ (used as knife handle material) is that it can be damaged when exposed to some solvents and oils or aggressive detergents. Clearly these problems aren't immediately noticeable, but sometimes they can occur after a period of time (which of course is variable depending on the abuse to which the material is exposed). For this reason, probably, Cold Steel has always taken care of the quality of their products to meet the needs of all their fans, has decided (from 2013) to replace Kraton with the new material called Kray-EX TM, on all their product lines including pre-existing versions. The sheath, made of Kydex, has a clean and simple design, offering a greater carrying flexibility thanks to the various mounting options (given by the holes and notches on sheath outline) that allows integration with backpacks, vests, and other systems. The patented Secur-Ex retention system is among the best on the market; the sheath is perfectly contoured around the blade, and the pressure lock system is made in such a way that the guard of the knife makes the retention, without the need to use the release buttons or anything else that would not immediately use the blade deployment. The nylon belt loop is made to be able to be dressed with a simple clip. Cold Steel's products price range varies widely, but overall they all have a very good quality / price ratio and it does depend on the materials used. The SRK price is almost of 70$ for AUS-8A version, and 140$ for SanMai III version. 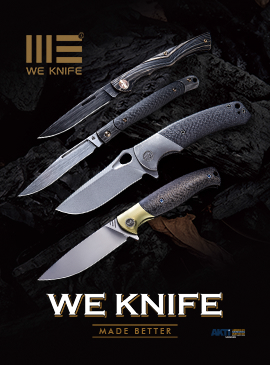 The SRK is a knife that offers amazing performance, able to withstand even the most extreme abuse. The ideator of this product certainly had in mind a knife that will meet every need and, beyond a shadow of a doubt, this design philosophy has been fully materialised in the SRK.